The two most frequently quoted constants in life are death and taxes. Two more things would-be homeowners can expect in the near future are increases in mortgage rates and housing prices. Interest rates have been kept artificially low for several years by the Federal Reserve in an effort to strengthen the economy. Policy is shifting to allow them to seek their own natural level and that will surely result in higher mortgage rates. Rates on 30 year fixed mortgages are up over 1% from January, 2013. 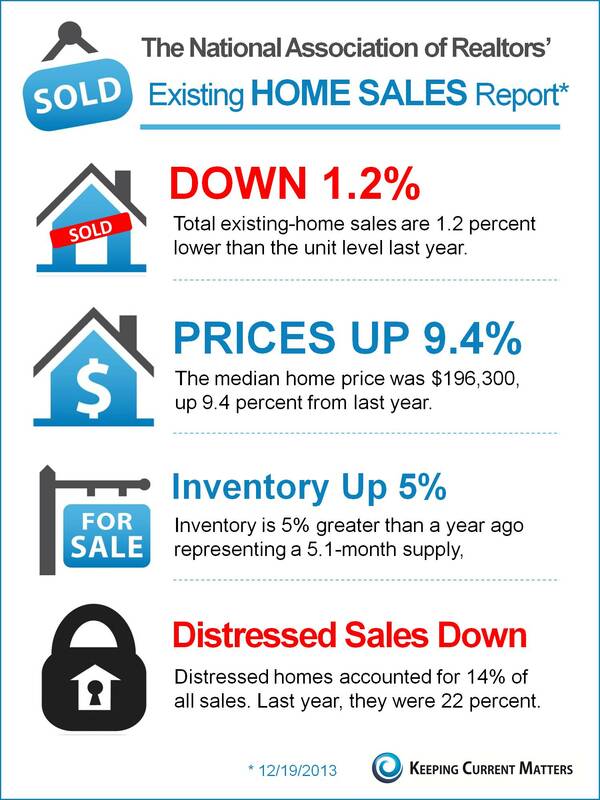 Foreclosure activity is down, new home starts are up and prices have been increasing in most markets for two years. Most experts agree that the cost of housing is going up. If the price were to go up by 2% and the mortgage rate by 1% while a buyer is “sitting on the fence” making a decision, the payment would go up by almost $175.00 each and every month for the term of the mortgage. Even if a person can afford to make the higher payments, what could they have done with that extra $175.00 a month? Buy furniture? Car payment? Principal reduction? Retirement contribution? Save for a rainy day? Click here to determine what the cost of waiting to buy will be using your price home.